MUSA KALENGA is a change agent for the marketing landscape within sub-Saharan Africa. 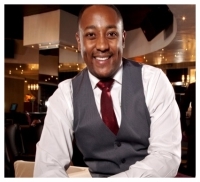 In 2012, he was voted one of the Top 200 Young South Africans by the Mail & Guardian newspaper. Between 2003 and 2011, Musa was hailed as a marketing fundi by Sunday Worldnewspaper and has received much acclaim for his work, including an unprecedented three nominations for the prestigious Black Business Quarterly Awards in 2008. An avid supporter of the digital age, he has a vibrant online presence. However, Musa’s enthusiasm for the African continent and for marketing makes him a charismatic public speaker.He’s a natural leader who prides himself on being the purveyor of strategy and the custodian of human interest. It is his belief that through unbridled thought and the use of technology young people in Africa will be able to create viable, affordable, sustainable solutions that solve crucial problems in our society. Musa is a seasoned communicator who strives to inspire young fellow Africans through his talks – ‘The intersection of humanity and technology’ and ‘The ability to act like a human and think like a brand’. His writings explore various genres, include marketing, digital media and technology, family and human interest. While he writes broadly, his passion for communication finds its finest expression in topics surrounding youth development and Africa’s advancement. Musa’s professional business experience spans more than twelve years, and includes building hisfirst company from zero to R6,5 million in turnover by the age of 26. He has an astounding breadth of industry reach from working with foreign governments and multinational companies to create innovative digital monitoring products inboth the FMCG and banking industries. He takes pride in refining his academic prowess, holding a Bachelor of Commerce from the University of the Witwatersrand, a Chartered Marketer (SA) designation from Wits Business School and, most recently, a GIBS MBA in March 2015, graduating as top student in Sustainability and Future Fit Business. Musa also holds and has held various industry respected accolades. He was the first chairman of theinaugural youth advertising board of South Africa, has served on the GlobalShapers in Johannesburg for the World Economic Forum and is currently head of the brand portfolio of the Interactive Advertising Bureau South Africa. Musa is an exceptional all-rounder who utilises his academic abilities and effective vocational training in a creative and innovative manner to ensure not only his own success, but the success of the next generation within a more digitised, connected world.